Dedication: To the Class of 1964, Paramus High School, Paramus, New Jersey, & to the Class of 1968, Rutgers College, New Brunswick, New Jersey. We lived these years together. The JFK photo used for the dedication page of the 1964 Paramus High School yearbook, the Delphian. The caption reads, “No evil can happen to a good man, either in life or after death.” – – Socrates. It’s one of the best portrait photos of JFK, in my opinion, & I’ve never come across it anywhere else. In our day after Kennedy’s assassination, the respected columnist Mary McGrory was in line at the viewing at the Capitol Rotunda. She leaned over to Daniel Patrick Moynihan, at that time Assistant Secretary of Labor, and said, “We will never laugh again.” Moynihan responded, “We will laugh again, but we will never be young again.” He was prescient, hinting at our unrequited idealism to come in the years ahead. I dare say our generation would stake a claim to the strongest of emotional ties. He was elected President in November, 1960, at the outset of our freshman year of high school. We witnessed his campaign characterized by “vigor” which made us believe he would be a new kind of President with new ideas at home and strength abroad. Perhaps he was the candidate best suited to stand up to the Soviet Union and protect America’s preeminence in the world. And it was during JFK’s brief 1000 days in office, while we went about our high school careers, that he was that kind of leader. – -Energetic, far reaching, and, in the end, tragic. His qualities of idealistic leadership had a great impact on our high school years. We unknowingly went about emulating his example of service and achievement in our smaller, lesser school goals and activities that marked these precious years. While we went about our lives, our President gave an outstanding inaugural address. His famous, eloquent words, with the help of his speech writer, Theodore Sorensen, challenged us to serve our country and promised that America would stand up to any foe to defend liberty. We were taken by his lofty, confident air. 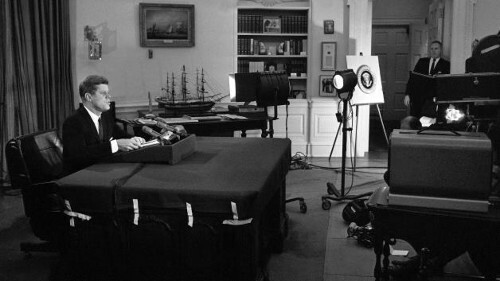 John F. Kennedy was the first President to institutionalize the televised press conference. The press conferences, credited to be every two weeks, in actuality averaged every 16 days. –quite a record. Yet, when I read of the modest agenda he had in mind for his administration of lowering unemployment, addressing US-Soviet relations, and progressing on civil rights, what followed in the brief time he had in office was staggering. – -The Bay of Pigs invasion of Cuba, Joint Session of Congress in which he challenged us to go to the moon and back in this decade, the Cuban Missile Crisis, the Civil Rights movement/protests/integration/proposed bill, US-Soviet relations/the Berlin Wall going up/ the Nuclear Test Ban Treaty, and the beginning of serious US troop deployment to South Vietnam, to just hit the lows and highs of those years. It all ended so abruptly in beautiful weather in Dallas, Texas, on that Friday afternoon in November. Our recollection from high school was hearing the news on the “PA System,” public address system, the infamous speaker box in each classroom in our high school from which the principal always spoke to us. – The shocking words coming from the principal, the classroom teachers trying best they could to talk to us, some student screams and crying and a few collapsing onto the hallway floor. “Would there be school activities, the Saturday football game? pondered our principal. “Of course not!” I audaciously counseled the principal. We knew the gravity of the moment. He was our President. This photo was taken by me, Saturday, March 21, 1964, on our Senior Trip to Washington, D.C. 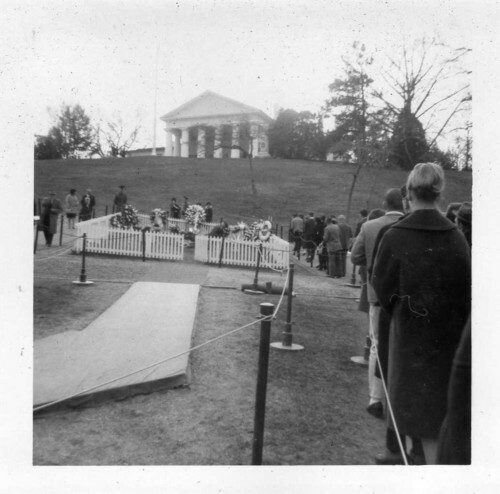 According to the itinerary, around noon we visited JFK’s crudely erected grave-site at Arlington National Cemetery, just below Arlington House (the Curtis-Lee mansion). Again, this photo was taken by me, March, 1964. (See the above caption) A close up of JFK’s grave, marked by the eternal flame. To the left is a headstone for Patrick Kennedy who died in infancy. As student council president, I placed a wreath at President Kennedy’s grave on behalf of our Class of 1964. There was the great sorrow and heavy doubt. Would the hopes and promises he kindled be realized? Images of him, his family, his White House were still vivid in our minds. I remember we ran a huge clothing drive in his memory for the poverty stricken Appalachia area in early 1964. 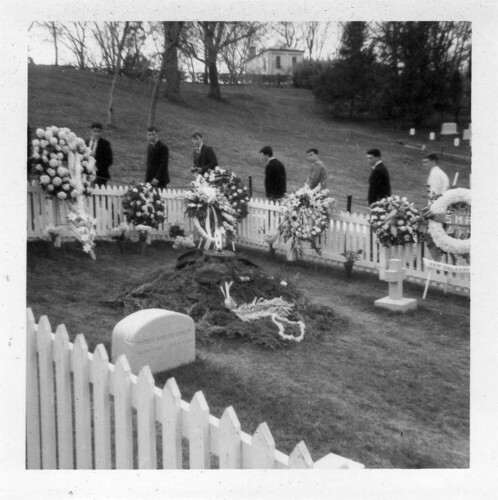 We visited his grave at Arlington National Cemetery during our senior trip to Washington, D.C., March, 1964. But then after graduation many of us were off to college or jobs. Life went on, as they say. We did not live in despair of our lost President but more in hope that all he stood for had not died with him. A few of us even went to the 1964 Democratic Convention conveniently held in Atlantic City, New Jersey, and got to brush elbows, literally (no joke! ), with Robert Kennedy in the makeshift Boardwalk museum tribute to his brother. During our college years we could point to President Lyndon Johnson’s “Great Society” programs including Medicare, Medicaid, environmental protection, aid to education, the “War on Poverty” legislation, and more. To these great social programs, LBJ added his impressive civil rights record, fulfilling the work begun by JFK, with passage of the Civil Rights Act of 1964 and the Voting Rights Act of 1965. But the vestiges of hope were already waning with the race riots of the mid-1960’s, escalating into cities burning in 1967 and 1968. Then there were the increasing unrest and anti-war protests with the Vietnam commitment of troops after the 1964 Gulf of Tonkin Resolution, culminating in the troop buildups of 1967 and 1968, eventually reaching over 550,00 American troops. (We cannot forget the tumultuous, explosive 1968 Democratic Convention in Chicago!) – -Some of us were eventually caught up in the draft or volunteered to serve in Vietnam War. But then in that spring of our senior year of college in 1968 came the assassination of Martin Luther King Jr. that April. Followed by the assassination of Robert F. Kennedy in June of 1968, immediately after our college graduation, it seemed that all hope of any JFK dream, the idealism, had died itself. RFK was our last hope. Robert Kennedy always ended his stump speeches running for the 1968 Democratic nomination for President with the words loosely borrowed from George Bernard Shaw (that were a favorite of his brother Jack as well! ): “Some men see things as they are and say, ‘Why?’ I dream of things that never were and say, ‘Why not?’” Those words seemed to have kept John Kennedy’s idealism alive until Robert Kennedy was no more. 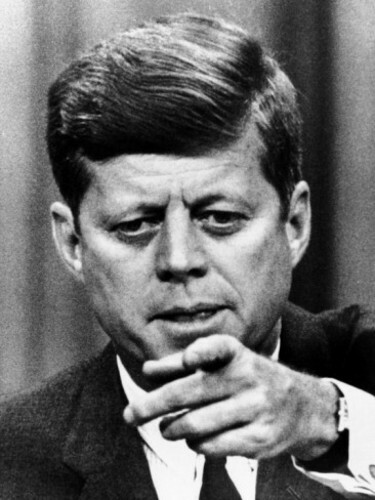 What does JFK’s death mean to us? I think the emotions of our generation, in particular, are inextricably tied to JFK by our unrequited idealism. I am not speaking just of our hopes in and for him unrealized, unfulfilled, though that part certainly cannot be denied. But I speak of our own failed idealism as a result of experiencing our loss and our disappointment and our discouragement in the years which followed. What I am getting at is that as a result of the loss of JFK and the aftermath, we did not fulfill our potential to serve. To the contrary, we were driven to withdraw into our own field of selfish fulfillment. Oh, you can add further disparagement: there was Teddy Kennedy’s tragic escapade on Chappaquiddick Island, July, 1969; the Kent State massacre of four college students by the Ohio National Guard in 1970; the Watergate break-in, 1972, and cover-up; the first resignation of a President with the departure of Richard Nixon in 1974. Edward M. Kennedy tried to rekindle the flame when he challenged President Carter in the 1980 Presidential Primary. If you have any doubt, hear his words at the 1980 Democratic Convention conceding to Carter: “For all those whose cares have been our concern, the work goes on, the cause endures, the hope still lives, and the dream shall never die.” The words were inspiringly delivered. However, to take them to heart seemed to deny that the dream had died. To prove the point, shortly after in 1982 Ted Kennedy announced he would not run in the 1984 Presidential Election. He acknowledged that the Senate was a fully satisfying career. Fast forward to the 2004 Presidential Election and Teddy sought to “pass on the Kennedy chalice” to John Kerry, his fellow Senator from Massachusetts. That having failed, Teddy, joined by Caroline Kennedy, endorsed Barack Obama in the 2008 campaign. Teddy was hoping through Obama to restore the “fading luster of Camelot.” On the other hand, Obama needed Teddy’s credibility within the Democratic Party to win the nomination. It was clear to the honest broker that the JFK promise had long faded. 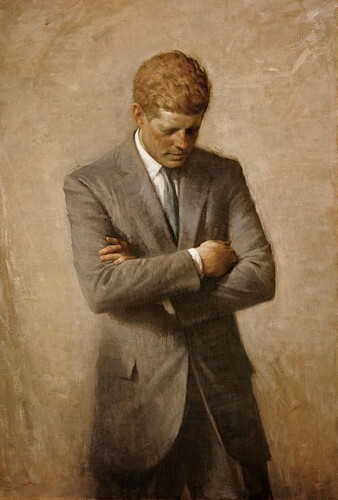 White House “Oil Portrait of John F. Kennedy,” 1970, by Aaron Shikler. Do you like it? I do. It’s supposed to demonstrate our grief for the loss of our President & acknowledgement of the time in office he was denied. But I think John F. Kennedy deserves a traditional presidential portrait to represent his legacy & achievements while in office during the time he did have in the White House. Excuse us for living, but we know there are many exceptions to our generation’s general turning away from national service. In fact, you know a prominent one; Bill Clinton! – -High School Class of 1964 and college Class of 1968!!! A Thousand Days, 1965, by Arthur M. Schlesinger, Jr.
Robert Kennedy & His Times, 1978, by Arthur M. Schlesinger, Jr. This was a very interesting read Phil! I never knew much about Kennedy, except all the speculations about his assassination of course, so I find this piece fascinating! I really hope you will write more about history, because you write in a very understandable way and I really like the subjects! Ah Phil, thanks for all information. PT109 veteran. Massachusetts Favorite Son. JFK. Joe Kennedy Sr. dad of JFK had some prohibition escapades during prohibition running Rum up and down the coast. I was in 7th grade at Winfield School that infamous day John was killed. We got sent home early that day. To retire to the wonderful state of Massachusetts from New Jersey,certainly an interesting turn of events in my life. All the local stations are commemorating this very sad 50th anniversary day. I graduated from RHS in June of 1969. Serving the fellow man is a cornerstone in my life. Still donate a pint of Blood to the Red Cross every 2 months. A couple of gallons club has helped many poor needy souls. Kennedy’s words inspired me. A kid from good old Winfield. God Speed. Have a Blessed and Wonderful Thanksgiving. Peace. interesting read. I do like the above “reflective” portrait of Kennedy-beautiful. Thank you for your article about the Kennedys. So much of what you wrote rings true for me as well; the pain of the loss of the three great leaders holds fast to today. Nevertheless, I have an innate skepticism about the notion of seeking our ideals by way of political leaders, who are, after all, the heads of the distorted social hierarchy under which we all struggle – with some who struggle far more than they ever should for reasons not of their own creation. With enormous power and half the great wealth of this nation lately in the hands of 2% of its people, the pains and hungers of the less fortunate are inevitable, and it should not, need not be so. While this is not to say that great leaders cannot change the world, my focus is more on what I perceive as the greater ideal of changing the system from one of hierarchy with its innate levels of wealth, power and levels of authority, to one of universal humanitarian and Earth-friendly values, beginning with what are now regarded as the lowest in our social system. Only when humanity is led from within, rather than from without, will we be able to hold fast to any long term hope that our ideals will be secure. As great as a leader may be, if the masses are not of a similar mind from the depths of the heart of their own value system, the wheel of time will lead to new leaders who are not of the same greatness of mind, and the masses will turn once again. We have seen that happen again and again in our short lifetimes. The sixties we lived, with its ideals waned and the ideals are no longer the heart of our world, and very much today the suffering of the many invisible among us is dead wrong and an indictment of our system, our leaders and the wrongheaded values they represent. Of course, no system in itself is incorruptible, as we now see at home in America in recent years, as well as in the great historical experiments such as socialism and communism, and therefore my own greater focus is neither on the leaders nor the system. I begin with my own weaknesses, of which there are many, and many of which come from exposure to a society in which great humanitarian values were not foremost among the many formative childhood experiences we endured – even despite the efforts of goodhearted parents. When I am at my best – or perhaps at least my somewhat better self – I can be a better spouse, parent, grandparent, friend, and better person throughout my human interactions of all kinds. I cherish my idealism – and yours – probably in large part from the idealism of my heritage, including the fact that my mother was a child in a utopian community, where my parents later returned when they raised their first two children. Yet I am all too aware of the weaknesses in all systems and in all people, since we are all products of our wider social heritage, which includes such abominations as racial slavery, which still resonates to our society’s detriment today. Kennedy’s great speeches meant little to the Vietnamese who died during his war. And the wealth, power and influence of his and his family’s, even when well used, was nevertheless a telling contrast with the desperate conditions of poverty and powerlessness of others whose spirit, but for the fact of the condition of their birth, may have been as great as his. Nelson Mandela’s great spirit and astonishing accomplishments, along with that of Desmond Tutu and others, lifted me from despair to hope, yet South Africa remains a place of enormous inequity, desperate shantytowns, and questionable follow up leaders. The utopian community of my mother’s heritage had its own weaknesses and vulnerabilities, as they all do, and it eventually collapsed under the weight of the greater society and its unfortunate incursions (that’s another chapter), as well as its own internal human weaknesses. My article on my powerful experience of singing a great requiem for Kennedy’s funeral is an edited version of a portion of a chapter from my autobiographical sketches, a work in progress. Since the article was printed, I made a small change – an addition. To the sentence “The emotion and historicity of the situation suddenly landed heavily onto my consciousness, and only then the tears came to my eyes,” I added the following: “not only for the murdered man, not only for an assassinated President, but for all of us and our broken world, where people do terrible things to each other.” For that is what the tears were really for: for you and me and for everyone else. Phil, my ancient friend, I suspect you may agree with some or much of what I have written today. Thank you for your good words and for your very evident goodness of heart. No excuses needed for your living. I could never say enough about your thoughtful comments here. You are correct in that we agree. Our country’s considerable ills, the world’s social & economic ills, are beyond leaders & ideologies. I wonder if you are encouraged as I am by the philanthropic efforts of people like Bill Gates. To take a social or economic problem in the world & simply address it & make some progress…..Can we hope for more? Your edited closing words of your recent article, that our tears were really for each other, were so poignant. You think deeply, my friend. But you already knew that! –I like that! BRILLIANT BLOG!!! Really loved the history in it, your pictures, just WOW! I really enjoy reading this educational post! 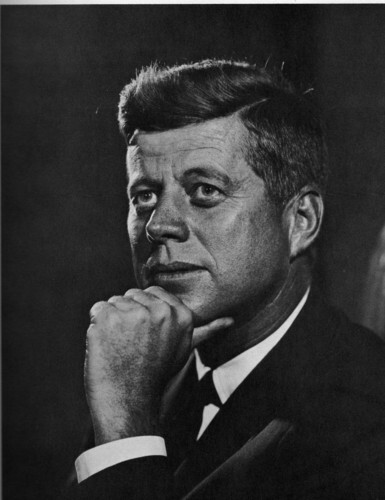 Thank you so much for great information about JFK and the remembrance of his death…sad and tragic. His painting by Shikler is truly remarkable! Hi Phil — I’m just now weighing in with this being my generation and having lived through this, as well. It’s hard to explain that era. There’s was so much going on in high ideals and giving voice to differing opinions as opposed to status quo. I, too, wrote a post on where I was and what I felt when Kennedy was assassinated (“Do You Remember? 50 Years Ago Today!”). Our whole world changed. We were young with bright futures full of promise, hopes and dreams. Life was being thrown at us from all directions and we were tested from all sides. I’d like to think now, as baby-boomers, that we survived somehow and tried to piece our world back the best way we knew how. Maybe, we didn’t do it in the best of ways by sprinkling it with misguided glory and overprotecting our children. But, we still love with all our hearts, have dreams and hold out hope for another to stand up and represent the values we hold true in our hearts and pave the way once again, putting us back on track, uniting us and reminding us why we love one another and this great country. Thank you for sharing your heart. I understand this tribute and what you feel. You’re welcome, Phil. It can look to be doom and gloom in looking at where our country and the world are at today. But, I can’t help but believe the seeds of those high ideals and truths that the Kennedy’s and Martin Luther King, Jr. planted will again sprout and be brought to life. I see some evidence of it today and some light beginning to shine in some of the young people.